What’s on your Christmas list? Is it the latest iPhone? Large screen TV? Or maybe simply a white Christmas with friends and family sharing a meal as the brightly decked tree sparkles & glows near a warm crackling fire in the fireplace? One thing for sure though it’s not water you are dreaming about this Holiday! Ah, but yes Virginia, there is someone out there that is dreaming of just that and she lives right here in the good ole U.S.A. But wait! There’s more…this young lady is not dreaming about water for herself, she gets that from her kitchen faucet, just like you and I. No, her dream is much, much bigger! She’s dreaming of water for an entire community! Claire is not your typical 13-year old and hasn’t been since at least the age of 8. 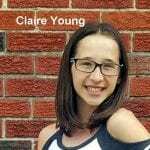 When Claire was 8 she went online in search of a charitable organization that she could give to. She stumbled across the Hope Water Project that provides wells for people in remote parts of Africa. Her tender heart broke as she realized that there are people in other parts of the world that often spend the better part of their day in search of water. And what they find is usually filthy. When Claire discovered that all of those hours usually result in muddy, contaminated water, filled with disease from animals and such, she began to feel sick to her stomach. How could we let this happen, she wondered? Why are there people in this world that have no choice but to drink from filthy rivers, ponds and yes, sometimes even puddles? And, more importantly, what can I (Claire) do to change this awful reality? This note is posted on Claire’s wall and she looks at it daily to remind herself of the suffering that other people in this world endure AND more importantly to remind herself that she can and IS making a difference in this harsh reality! When she speaks in the note about “saving up MY money…” she is talking about all of the money that she receives from birthdays, chores, Christmas and more, from family and friends. All of that money ends up in her fund. Her reference to the Hopewell People is actually a reference to the Pokot tribe that is being helped through the Hope Water Project. For Claire’s 11th birthday, she and a friend had a joint birthday party and the two of them asked their guests to give money for their cause instead of gifts. They received over $1,000 and had the honor of presenting that money in person to the people who run the Hope Water Project! It was after that donation and reading some books about the problem and how far reaching it is, that she decided to take it one step further and do her own well! She realizes that it will take some time. 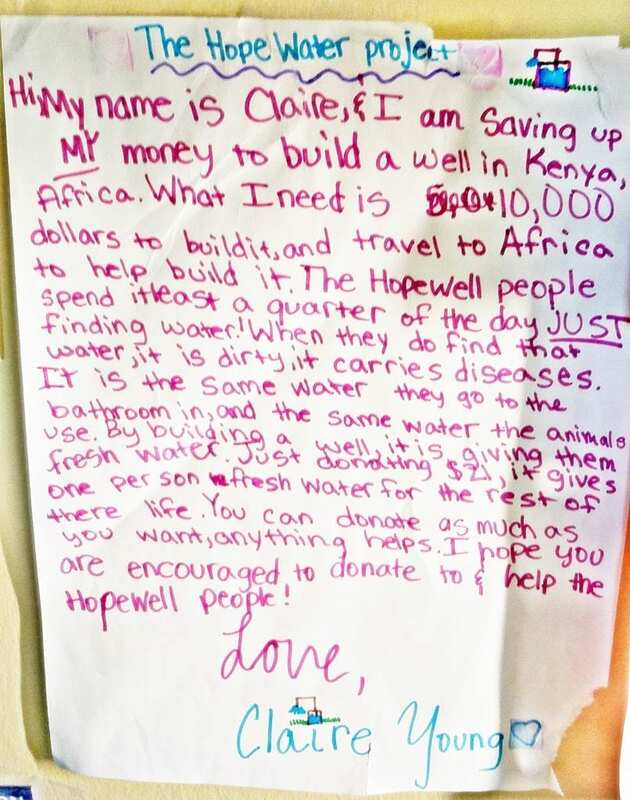 Claire intends to forgo her senior class trip for a trip to wherever she finds the greatest need and then to put in a well for those who don’t have fresh water. My hope is that she can reach her goal BEFORE she’s given up all of the gifts that she so deserves for Christmases, birthdays & chores between now and then. Every dollar helps her get closer to her goal and is much more treasured by Claire than I can possibly tell you. Let Claire know how much her efforts are appreciated by encouraging her with a special message of thanks or by giving whatever you can to help her have the Merriest of Christmases. You can leave a message or donate to Claire’s Go Fund Me Water Trip account by going here! Your gift will not only help Claire realize her dream, it will make you a part of her dream because, through her, you will be providing an entire community one of the world’s most basic needs – water. P.S. A note from Krystalya. In case you are wondering Pat Patrola is my baby sister. Well, she’s not really a baby anymore, but you get the idea. I too support Claire in this endeavor and will be contributing 10% of all sales to her fund raiser for the remainder of 2017 and all of 2018. Want to stop sugar cravings, carb cravings, and lose weight? Put one or all of these Krystagraphs™ on your refrigerator now and connect with the energy every time you go to the refrigerator. Or place the magnet on your metal filing cabinet near your desk (remember though – don’t get them close to electronics). Package includes 1 of each magnet and a set of matching stickers. Order Your Weight Loss Magnets & Stickers HERE! Keep your mind focused on your wealth and prosperity with this set of prosperity Krystagraphs™ on your refrigerator now to connect with the energy every time you go to the refrigerator. Or place the magnet on your metal filing cabinet near your desk (remember though – don’t get them close to electronics). Package includes a set of 3 prosperity Krystagraphs™ magnets and a matching set of stickers. Order Your Prosperity Magnets & Stickers Here! Remember 10% of your purchase will go directly to Claire’s Go Fund Me Project.